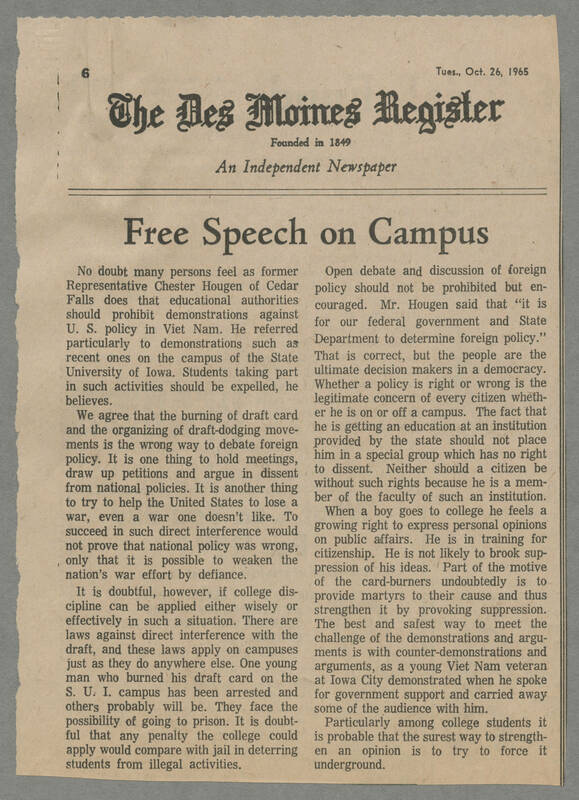 Tues, Oct. 26, 1965 The Des Moines Register Founded in 1849 An Independent Newspaper Free Speech on Campus No doubt many persons feel as former Representative Chester Hougen of Cedar Falls does that educational authorities should prohibit demonstrations against U.S. policy in Viet Nam. He referred particularly to demonstrations such as recent ones on the campus of the State University of Iowa. Students taking part in such activities should be expelled, he believes. We agree that the burning of draft card and the organizing of draft-dodging movements is the wrong way to debate foreign policy. It is one thing to hold meetings, draw up petitions and argue in dissent from national policies. It is another thing to try to help the United States to lose a war, even a war one doesn't like. To succeed in such direct interference would not prove that national policy was wrong, only that it is possible to weaken the nation's war effort by defiance. It is doubtful, however, if college discipline can be applied either wisely or effectively in such a situation. There are laws against direct interference with the draft, and these laws apply on campuses as they do anywhere else. One young man who burned his draft card on the S.U.I campus has been arrested and others probably will be. They face the possibility of going to prison. It is doubtful that any penalty the college could apply would compare with jail in deterring students from illegal activities. Open debate and discussion of foreign policy should not be prohibited but encouraged. Mr Hougan said that "it is for our federal government and State Department to determine foreign policy." That is correct, but the people are the ultimate decision makers in a democracy. Whether a policy is a right or wrong is the legitimate concern of every citizen whether he is on or off a campus. The fact that he is getting an education at an institution provided by the state should not place him in a special group which has no right to dissent. Neither should a citizen be without such rights because he is a member of the faculty of such an institution. When a boy goes to college he feels a growing right to express personal opinions on public affairs. He is in training for citizenship. He is not likely to brook suppression of his ideas. Part of the motive of card-burners undoubtedly is to provide martyrs to their cause and thus strengthen it by provoking suppression. The best and safest way to meet the challenge of the demonstrations and arguments is with counter-demonstrations and arguments, ad a young Viet Nam veteran at Iowa City demonstrated when he spoke for government support and carried away some of the audience with him. Particularly among college students it is probably that the surest way to strengthen an opinion is to try and force it underground.